Does anyone have any Comfrey Cuttings they are willing to trade for some seeds? I would be happy to send some comfrey (roots of this are best to send) but, I will have to wait til it quits snowing! Yes, its snowing in the Charleston area. My comfrey was still green and growing yesterday. It does well in frost. I cut leaves and put around plants that may need a little boost, and it makes a very good compost ingredient. It's supposed to be in the 60's next week, so maybe then. @littlejo wrote: I would be happy to send some comfrey (roots of this are best to send) but, I will have to wait til it quits snowing! Yes, its snowing in the Charleston area. Wow, that would be great, Let me know about some type of reimbursement and it's No rush, I guess I can put it under my grow lights till spring. Do you know what cultivar it is. I'm a little nervous bringing in a True Comfrey. I'm not sure of the name, I used to have both but 1 died off. This 1 blooms a lot, but does not propagate by setting seeds, etc. More plants may grow form the roots, but you can always give them away! @littlejo wrote: I'm not sure of the name, I used to have both but 1 died off. This 1 blooms a lot, but does not propagate by setting seeds, etc. More plants may grow form the roots, but you can always give them away! Thank-you. This is not for a SFG these will be planted ground level around my yard. I have 4 spots that I want to fill in with something and figured comfrey would be perfect. The comfrey has a pretty blue flower. Will check on the confrey , my strawberries, and other winter growers as soon as the snow melts, maybe Monday. 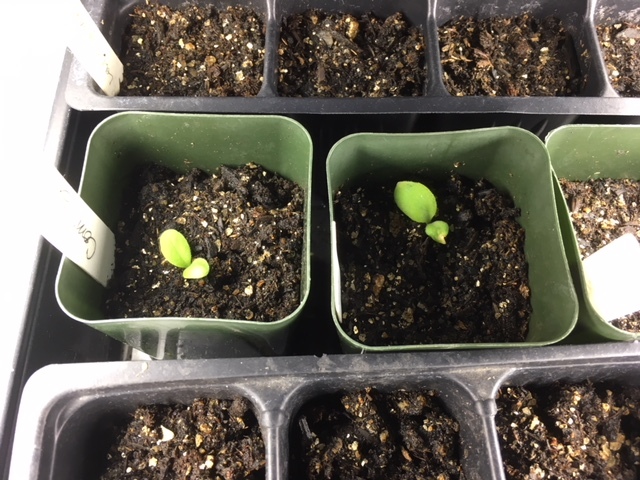 Someone sent me some comfrey seeds (terrible record keeping) and they have sprouted! I will plant them in pots. How big do they get? Will 2 fit in a 10 or 12" pot. Or do they each need their own pot? Thank you in advance. I did not send you the seeds, but I'll see if I can answer. Comfrey has a long taproot after it gets full grown. That makes it able to draw nutrients from deep in ground and put in leaves. I suppose 1 per pot til bigger, then it could be put in ground, it will winter over very well. Mine was still green when it snowed, and already has blossoms on 1. Shout out to Littlejo for sharing some Comfrey, thanks again, it's now the turtles favorite spot. @sanderson wrote: Someone sent me some comfrey seeds (terrible record keeping) and they have sprouted! I will plant them in pots. How big do they get? Will 2 fit in a 10 or 12" pot. Or do they each need their own pot? Thank you in advance. Comfrey grows up to three feet tall. When starting to grow in the spring, it can be cut right down and the leaves are good for the compost pile with all those nutrients from deep in the ground. It regrows quickly. I have had access to a dozen comfrey plants just down the road from me and usually I harvest twice, then let them grow to flower and seed. The plants are on city property, that strip of land fronting houses that the householder has right of way so as to gain access to his/her property. Unfortunately for me, the hose that is above the property has been sold and the new occupant is stripping all the wild vegetation on this land and is going to make it well-groomed and pretty. so there will go "my" comfrey. I must go and check on the wild part of my garden and see if the comfrey I planted there has survived. I'm intrigued to try comfry but a bit cautious given my recent experience with borage. I wanted borage. Tried to grow borage. I failed. Then... Borage grew. I let it grow. Into a big bold plant four feet high and six feet in diameter. I took seeds and transpalneted where I wanted them, they're growing. Ive also been pulling borage out of my SFG every week. And pulling from by the compost. And pulling it from the lawn. And pulling it every where I walked when carrying the cuttings to the compost or going to make the cuts. @No_Such_Reality wrote: I'm intrigued to try comfry but a bit cautious given my recent experience with borage. I wanted borage. Tried to grow borage. I failed. Then... Borage grew. I let it grow. Into a big bold plant four feet high and six feet in diameter. I have had similar experience with Comfrey that you describe with its cousin, Borage. I have it growing in a fence row of what used to be a pasture for cattle we raised. It has spread several feet on each side of the fence, and is controlled only by regular mowing. The good thing about it, though, is that it is great for Compost Starter and for making Comfrey Tea fertilizer which the peppers and tomatoes love. I originally thought that if I kept it cut down so that it did not go to seed it would not spread. Not so, it spreads by root very fast. Another benefit of it, though, is that the deer can't stand it and won't jump over the fence into our garden area as long as that comfrey is there. I am looking for some Russian Comfrey Bocking 14 root pieces. The flowers from the Russian Comfrey are supposed to be sterile and will not spread like Common Comfrey does. I want to start a batch of them along the property line in the front yard as both decorative plants, and for the leaves to use in compost. I found several sites that sell the crown and roots, but they all seem pretty expensive. Anyone have Russian Comfrey Bocking 14 plants to verify they do not spread wildly? If so, would you be willing to share some root pieces. I commented on this thread over a year ago (the page previous to this, and as it was too early in the year I lost the opportunity to take some roots. they were beautiful plants and as I said, I harvested then twice before letting them go to seed. It was some years before I found out, via this forum, that they were Russian Comfrey. they were handsome plants, and after cutting to ground lever after the harvesting, they recovered well and grew very quickly. They have lots of goodness in them. The Duplex being built above them are getting to the finishing stage, but alas all the forecourt (that actually belongs to the city, was dug up several feet deep to give a level entrance to the two garages. All the topsoil was take away so I am sure there will be no more Comfrey. Last year at the Farmers' Market one stallholder was selling ointment that contained comfrey but I was not able to give her any roots that she wanted. @OhioGardener wrote: I am looking for some Russian Comfrey Bocking 14 root pieces. The flowers from the Russian Comfrey are supposed to be sterile and will not spread like Common Comfrey does. I want to start a batch of them along the property line in the front yard as both decorative plants, and for the leaves to use in compost. I found several sites that sell the crown and roots, but they all seem pretty expensive. I seem to remember that Bocking 14 was defined by the Henry Double Day foundation, due to being the 14 sample they were trialing .. can't remember where the name Bocking came from but it might be the name of the place where the institute was situated . It is not invasive and does flower , our plants... 3 foot apart gave forth sort of half lilcac to blue colours giving around 150 flowers per plant each being about three quarters an inch across by three quarters deep . I tried to grow some of their seeds but none took . Propagating a chip of root from near the crown the size of a thumb nail with a growth node onit is the easiest way to get it to reproduce . Slips keep well in damp peat or well damp paper towels in a heat sealed food bag in a small strong carton for almost a week in the postal system & will still grow so long as they haven't been exposed to excessive heat . I know that because that's how I got mine from a friend up in Scotland . Honey bees love them so do most nectar drinking insects , butterflies & moths as it has a long flowering season . Till last year we had nine plants along out front garden wall . They reached about 3 foot tall with a spread of the same size . ( I purposely weed killed them when I killed off the old lawn for re- seeding in September last year ) . I'm not sure that Russian variety you mention is quite the same thing & I'm too lazy to read " The history of Comfrey" that I have on my Kindle to find out as it has several hundred pages to plough through find out . I'm glad this post was bumped to remind me to start some comfrey seeds. The seeds I received last year were viable but life got in the way from nurturing the starts.